Leaving New Year's resolutions behind, One Word 365 is about picking one word to define your year. One word that sums up who you want to be or how you want to live. One word that you can focus on every day, all year long. Last year I embraced my one word: SERVE. I remember in July thinking how strange it would be when this was no longer my word. It will always be a part of me, but as I continue to grow in Christ and his love, I will take on new words and new ways of living for him. 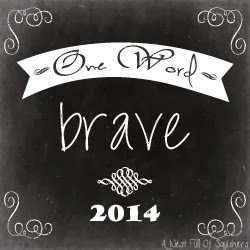 BRAVE is my word for 2014. Last year I did some things and said some words that were hard. I remember driving one day towards one of these situations, willing the radio to play Brave by Sara Bareilles. It didn't work. So I pulled over and found the song on my phone. The words flowed over my heart as inspiration and encouragement to speak the words I needed to say. 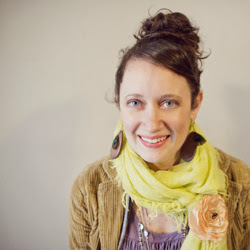 When I was finished, a friend pulled me aside and told me I was brave for saying my words. God has been speaking this word to me for months. I want to stand up and be brave for Him. When He gives my heart a nudge to start a #projectlove, I don't want to question what others may think. I want to jump in bravely following His lead. I want to set an example of bravery for my five sweet squishers. I pray they will be brave for God and His kingdom. I am praying that when I look back on 2014 it will be a reminder of how God speaks truth to us and brings us to places we could never invision ourselves.